This forum is for sharing photos, videos, reports, and finding people from Anime Boston 2009. Naruto seems to be dieing off and this is probably gonna be my last year as Sasuke. Regardless though I met a lot of awesome naruto cosplayers. I was a Sasuke wearing all black with bright Sharingan contacts. Post pics here and if you saw me let me know! I am still looking for an Ino and Sakura I ran into as well. AB 11-LOL meme/troll/rage face & Zexion. AB 12-Sweet Pea from Sucker Punch. Current WIP. & Haloween Town Zexion. Current WIP. Hey everyone! I'm the Naruto who was running the Naruto photoshoot Saturday (I was also the Sakura that was helping run the Friday shoot). I do know there are some pictures of us from both Friday's and Saturday's shoots lurking around in the Post all Photos thread. I saw all of you who posted above me, but during the Photoshoot, I was sitting outside Friday while it was taking place. I was just watching it with the Marluxia and Vexen I was with, and I was the bruennete Deidara on both Friday and Sunday. (I was watching the Photoshoot from the grass area) I was Nagato on Saturday. Sakura, I remember seeing you walking by on Friday. I did notice it was the "Future Sakura" outfit. I agree. There were definitely a lot of us and I know we weren't able to grab everyone. I'm surprised we were able to keep it as organized as we did. Here ya go guys I have loads of pictures from the Saturday Naruto shoot in there. Maybe you can find yourselves. ^.^ Enjoy! i was the sai at the photoshoot. also the one helping killing the naruto before the shoot outside au bon pain. and i was kakashi on saturday. i think i was the only one with my actual hair, and when i posed i was doing 1000 years of pain/death. Mainly because I didn't know there was one 8D -first con-. I was pre-time skip Sasuke Saturday/Sunday. Once things settle down a little, one of us will probably start up the Naruto 2010 thread in the Cosplay groups and gatherings section and work out the whens and wheres of next year. [quote=TwinEnigma]I agree. There were definitely a lot of us and I know we weren't able to grab everyone. I'm surprised we were able to keep it as organized as we did. If the Neji who was there is on the forums, just like you to know that you're awesome. D: I am so sad I missed the shoot. I really wanted to go! I was Shippuuden Naruto in a Sage cloak Fri. and half of Sat. Definitely, everyone, check the "Post all photos here" thread. I've found a few galleries with us in them in there from both Friday and Saturday's shoots, as well as miscellaneous pics of Naruto cosplayers who I didn't see at the shoots. damn, i wish i knew there was a naruto photoshoot. I was the chakra cloak naruto on friday co-running the shoot with twin. [quote=Lover Of Deidara][quote=TwinEnigma]I agree. There were definitely a lot of us and I know we weren't able to grab everyone. I'm surprised we were able to keep it as organized as we did. Next year if I can convince her my girlfriend might come up and we'll be doing SasuNaru XD ANBU, Shippuuden, and SNJ. 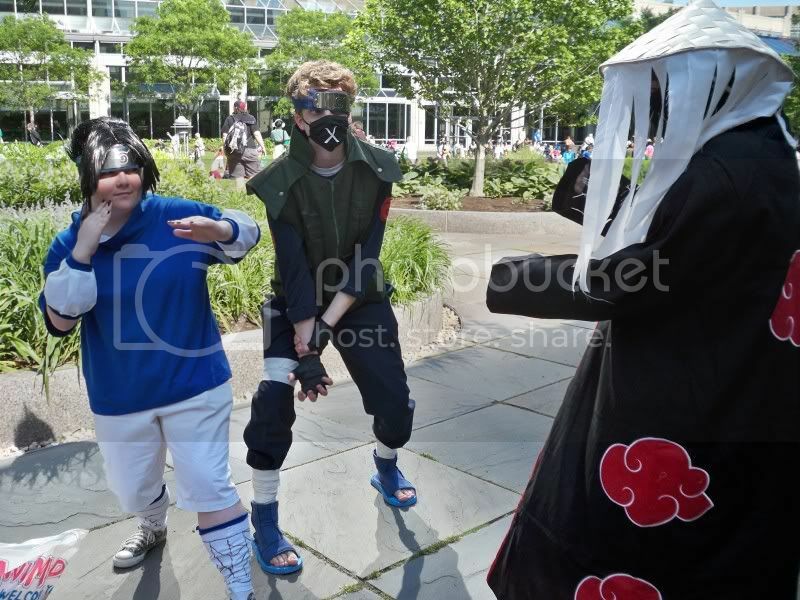 My SNJ was fail this year since my friend had my Naruto shoes and I was too crabby to be in cosplay. I was Orochimaru on Friday photoshoot and Orochimaru and Fan-art(orochi) Sasuke on Saturday. had loads of fun running around as a narutard yay first time ever being in a Naruto cosplay! I got a few pictures and will make a video and post it soon. These are the photos from my camera for the Friday shoot and some misc running around. [quote=haku]Naruto seems to be dieing off and this is probably gonna be my last year as Sasuke. Gee Whiz, Naruto cosplayer never seen one in my life, who would thought that anyone would cosplay as naruto, y'know since sometimes there are a million narutos (deeeerrrrrr). yeah well, there is so much good anime that doesnt get nearly the amount of cosplay it deserves. ok, ok, I get it naruto is a real legendery guy who is strictly epic with real lightning fast "ninja" moves. By the way... their is a million naruto's and 1 Sakura... XD ... I need sleep. I am USUALLY a Sasuke cosplayer since I have the contacts, outfit, and tattoos, but I decided to change it up and go Asuma this year. My gf was Kurenei, this was on Friday! Good times! I was part of the group that did the awkward fan service with Tobi, Deidara, Zetsu (me), and Kakuzu. bahaha. That was wrong on sooo many levels. but hey, fun time photoshoots w/ fanservice! Aww. I could've seen you, too. *Snaps fingers* Twice, actually. I just didn't go to the Artist's Alley. I was the brunette Deidara on Friday, and I was outside during the Photoshoot sitting there with a Marluxia and Vexen not TOO far from it. ...I have a BAAAAD feeling I could've met you... =O_0= *Faints* I was outside in the Courtyard during the Saturday Photoshoot, as well as during the Friday Photoshoot. i love meh sai cosplay. hopefully ill have a scroll for it next year. I was the Tobi that was traveling with the barrels and the large group of evil Shinigami. I remember fighting soooooo many Naruto characters, and dragging back half of them before they could make off with the barrel. I couldn't believe I missed the Naruto Photoshoot! ARRG! Next year! its by far my favorite. which was pretty sad looking (black pants underneath, no make-up, sneakers.) it'll be fixed by the next AB. - Aino Minako; Junior High Uniform[SM]. There were two Shippuuden Nejis and one Genin, but ah, a Lee did give me a ride for the photoshoot, and if you're that person, then thank you. It was really disappointing not to see a Gai-sensei though, hm? were you the one at the friday photoshoot with the giant shurriken? did anyone se me? I was the choji that had the lays chips...I know I had alot of pictures took but I am unable to find them...and I had to leave the photoshoot early so I didnt get to go out side. Please be aware this forum is for AB 2009 Memories. Please post within the 2010 Memories forum for topics related to AB2010. Thank you.